While the terrorist foot soldiers are fighting on the ground in Syria, another battle is being fought behind the scenes—one to gain influence over the global jihadi movement. This competition could raise the terror threat against Europe and the United States to a new level, as both groups aim to prove their capabilities. The Islamic State in Iraq and Syria (ISIS) started as a more extreme offshoot of al-Qaeda, but al-Qaeda’s central command officially announced in March 2014 that ISIS has no relationship with the leadership of al-Qaeda. The two groups also began fighting around that time, with conflicts taking place both on the ground and ideologically. In their fight for legitimacy over the jihadi movement, the groups will continue to fight each other, fight for control of Iraq and Syria—and experts warn that these rival extremists could soon turn their attention to launching attacks on the West in attempts to display their capabilities. Al-Qaeda has a lot of influence in the rural areas and among the very poor. The two men behind this fight are Abu Bakr al-Baghdadi, the leader of ISIS; and Ayman al-Zawahiri, the leader of al-Qaeda, and according to author and terrorism researcher Jere Van Dyk, while ISIS is putting on an aggressive show, al-Qaeda still commands more influence. The perceptions of ISIS were much different, however. He said ISIS is seen as a “flash in the pan.” They view its leader as just a remnant of Saddam Hussein’s Republican Guard—and when compared to al-Zawahiri, they see al-Baghdadi as having “no intellectual standing” and no moral authority. This view is part of the reason why ISIS is having trouble spreading beyond the conflict zones in Iraq and Syria. Outside of that, it has only managed to find some influence in the destabilized environment in Libya, and in Afghanistan where it was able to lure some former members of the Taliban with money. Elsewhere, the situation is much different. Whether it’s the jihadi networks in Saudi Arabia, Yemen, Egypt, Qatar, Kuwait, the United Arab Emirates, or even Sudan—ISIS has had little luck shaking the foundations laid by al-Qaeda. ISIS was able to make gains quickly, but the noise it made drew too much attention, and it’s starting to lose momentum. For example, while Russian investigators recently revealed that last year ISIS extremists made up to $200 million from stolen antiquities from Palmyra alone, their financial channels in oil and looted antiquities have been hit hard by U.S., Russian, and European efforts. Al-Qaeda, on the other hand, brings in less cash, but its black market income is more stable. With al-Qaeda in the Arabian Peninsula, alone, Van Dyk said he was told by a high-level source in Yemen that the extremists had $35 million at their disposal, which they had gained mainly through kidnappings in North Africa. Recruitment has followed a similar pattern. ISIS was drawing large numbers of fighters early on, through often brutal propaganda and the promise of well-paying work. This has slowed, however, through hits to its finances and efforts to stop its online propaganda. With al-Qaeda, on the other hand, Van Dyk said its links and networks to move fighters have been around since the war between the mujahideen and the Soviet Union (1979–1989). The problem is that Bashar Assad will likely stay in power, and in that environment the Al-Nusra Front will likely be regarded as the most influential local group that opposes the Assad regime. He noted, however, that both ISIS and al-Qaeda are often able to recruit young men because both are viewed as being against the dictatorships that are unfortunately common throughout the Muslim world—and both are able to offer work to people in countries where opportunities are hard to find. According to Scott Mann, a retired lieutenant colonel in the Green Berets and author of “Game Changers: Going Local to Defeat Violent Extremists,” even if ISIS were defeated and the war in Syria ended, it would likely only drive ISIS to form a base of operations elsewhere, likely in North Africa, and give al-Qaeda even more notoriety. He said that al-Qaeda “may actually have the long game figured out in Syria.” The problem is that Bashar Assad will likely stay in power, and in that environment the Al-Nusra Front will likely be regarded as the most influential local group that opposes the Assad regime. Still, the balance of power could easily change, according to Peter Feaver, a political science professor at Duke University and a former special adviser for strategic planning and institutional reform on the National Security Council for the George W. Bush administration. “What ISIL has done is to make good on some of Bin Laden’s longer-range plans,” he said, referring to ISIS by one of its alternative names. “Bin Laden’s strategic theory rested on what he called the stronger horse—that if you could defy the superpower and still be standing up there, and actually bloody the superpower, the Muslim world would rally to you as the stronger horse,” Feaver said. This theory was part of Bin Laden’s plans with the Sept. 11, 2001, terrorist attacks. He said Bin Laden made a miscalculation, however, and “thought the United States would fire a few cruise missiles back at him, and he’d still be standing.” Instead, the United States invaded Iraq and Afghanistan, launched a large-scale war on terror, and eventually killed him during an attempt to capture him in his Pakistan hideout. ISIS, on the other hand, has managed to launch terrorist attacks against the West and to seize territory for its caliphate, while still managing to remain standing. The goals of the global jihadi movement are to establish an Islamic caliphate in Iraq and the Levant, and to attack the “enemies of Islam” in Europe, the United States, and elsewhere. They don’t have a path back to their country … a lot of these jihadis are just going from one conflict to the other. While al-Qaeda still has support from many of the jihadi elites, Feaver noted that the actions of ISIS are winning it points in the ideological battle between the two groups. Despite some headlines about ISIS losing ground in Iraq and Syria, Feaver and several other experts told the Epoch Times that the wars are far from over. According to Paul Rexton Kan, professor of national security at the U.S. Army War College, no matter how things unfold in Iraq and Syria, both ISIS and al-Qaeda could prove significant threats to the West. It could be one of these ironic things where peace in Iraq and Syria is actually bad for Europe, unless they can find a way to reintegrate, repatriate, and de-radicalize these groups. As the fighting dies down in Syria, or if either group is forced to flee, it’s likely that some of the jihadis will also take the road to Europe. Kan noted it could lead to a situation similar to the Madrid train bombings, where one jihadi mastermind was able to convince otherwise moderate Muslims to launch a terrorist attack. “It could be one of these ironic things where peace in Iraq and Syria is actually bad for Europe, unless they can find a way to reintegrate, repatriate, and de-radicalize these groups,” he said. Michael Smith, principal of Kronos Advisory and a contributing expert to the Congressional Anti-Terrorism Caucus, said the war in Syria isn’t just a civil uprising. 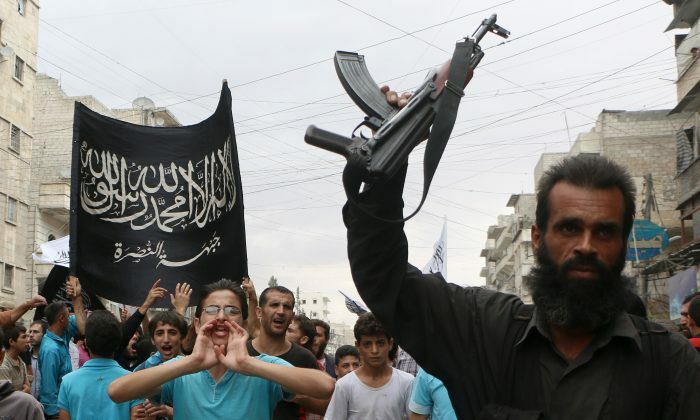 For ISIS and the Al-Nusra Front—part of the al-Qaeda network—their fight is rooted in the goals of the jihadi movement, and the instability in Syria merely presented them with an opportunity to further these goals. Their goals, he said, are to influence the international system, starting with the Muslim world, then spreading out from there—as ISIS has started doing with its claimed caliphate. Smith echoed a common sentiment that the longer ISIS is allowed to hold its bases of power, the more credibility the group will gain in the jihadi movement and the more danger it will present to the West. Van Dyk noted that in the rural areas of many Muslim countries, al-Qaeda and ISIS have influence because they are viewed as being opposed to the dictatorships they live under. Smith noted that U.S. inaction allowed them to deepen this image. The influence that the Islamic State and al-Qaeda have in Syria is something they have gained from our inaction. By taking the sidelines, the United States and Europe allowed jihadi groups to take the lead roles in the Arab Spring revolutions, which only helped raise the notoriety of the radical Islamic movements. “The influence that the Islamic State and al-Qaeda have in Syria is something they have gained from our inaction,” Smith said. He noted that it’s hard to sponsor any “moderate” group or national ally in the region, as there are many underhanded systems at play. In Libya, he said, jihadis who were part of the rebellion have now become stakeholders in the country; Iran sponsors Hezbollah and Hamas, and uses Assad as a proxy in Syria; Turkey has passively supported jihadi movements by allowing fighters to join the Syrian war unabated; and many similar issues are at play throughout the region. Smith noted that Assad has even done what the United States feared former Libyan leader Moammar Gadhafi would do by carrying out chemical weapon attacks. The same applies to concerns that led to the U.S. invasion of Iraq that its now-deceased leader Saddam Hussein was developing weapons of mass destruction—a recent congressional report noted that Syria has worked with Iran and North Korea to develop nuclear weapons. There are two parts to the radical Islamic movements, he said. One part is the action arm: the terrorists and the fighters. The other part is the political arm: the ones who try to influence political systems and spread propaganda. Retired Lt. Col. Scott Mann believes the best way to combat ISIS and al-Qaeda is to focus on combating their political arms, since this would degrade their notoriety—the factor that allows them to form bases of power and radicalize people to support their cause. Al-Qaeda functions as more of a somewhat loose network of jihadi groups that pledge their allegiance to it. The terrorist group started as a violent offshoot of the Muslim Brotherhood, which seeks to achieve the goals of jihad through open systems within societies. Much of al-Qaeda’s direct political work is conducted through its official spokespersons and influential imams. With ISIS, much of its propaganda revolves around professionally made propaganda videos, its use of social media, and its videos of horrific violence that often gets attention in U.S. and European news outlets. Mann said that combating the ideologies of jihadism can be difficult, since it requires going against the propaganda systems of radical Islam—which often use “political correctness” to attack counternarratives. Explainer: What Is a Dirty Bomb and How Dangerous Is It? Nuclear weapons and dirty bombs are frequently mentioned in the same breath. However, they are two distinct technologies. The group removed the workers—from the al-Badia Cement Company—to Dumeir, just about 25 miles northeast of the nation's capital.